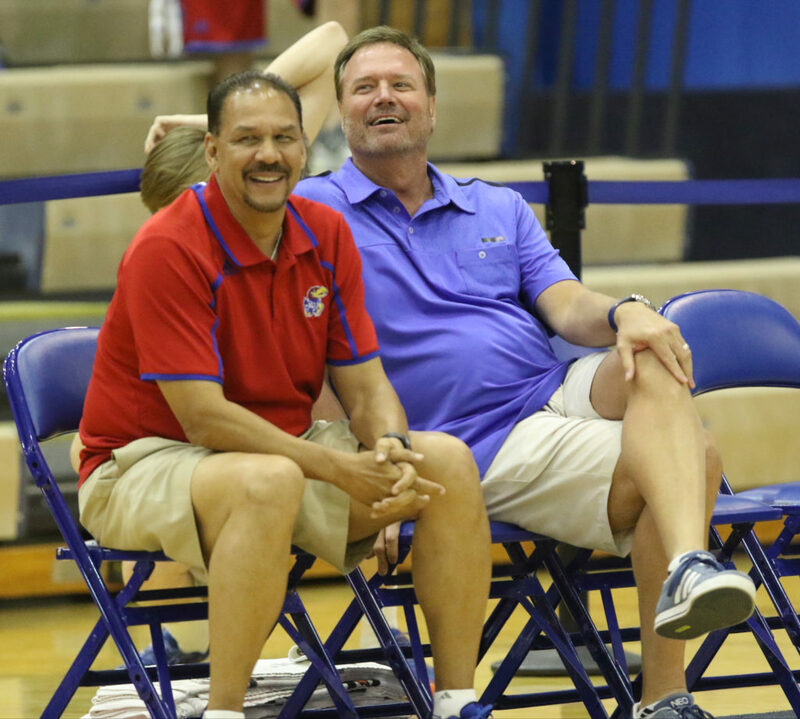 Kansas head coach Bill Self and assistant coach Kurtis Townsend watch with smiles during the campers vs. counselors scrimmage, Wednesday, June 8, 2016 at the Horejsi Athletic Center. 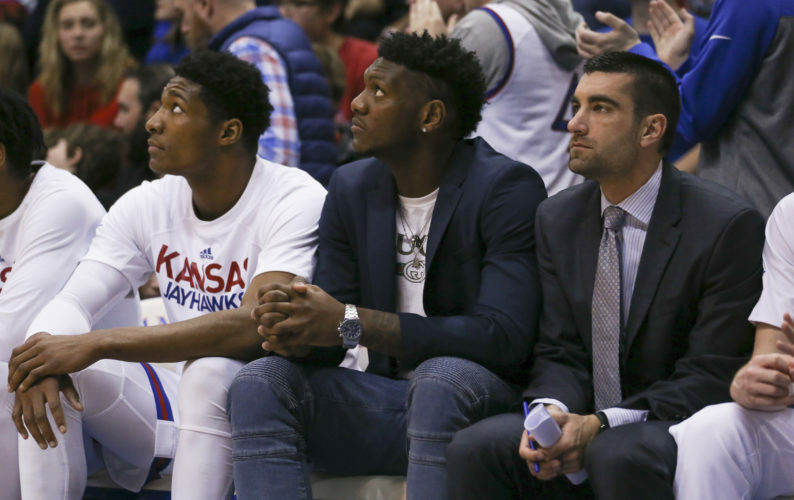 It’s reached the point where the issues that need to be addressed with the Kansas basketball program have grown beyond what’s provable and what may or may not lead to an NCAA violation. It’s bigger than that. It boils down to a central question: Does Kansas believe it has a clean basketball program? Not are they just doing what everybody else is doing. Not can it stay out of trouble. Those are separate, smaller issues. Does it believe it has a clean basketball program? Not does it want to believe it has a clean basketball program; rather, does it believe it has a clean basketball program? Monday, it was a series of vague texts between the Kansas coaching staff and Adidas that came out of reports from the trial on corruption in college basketball in New York. 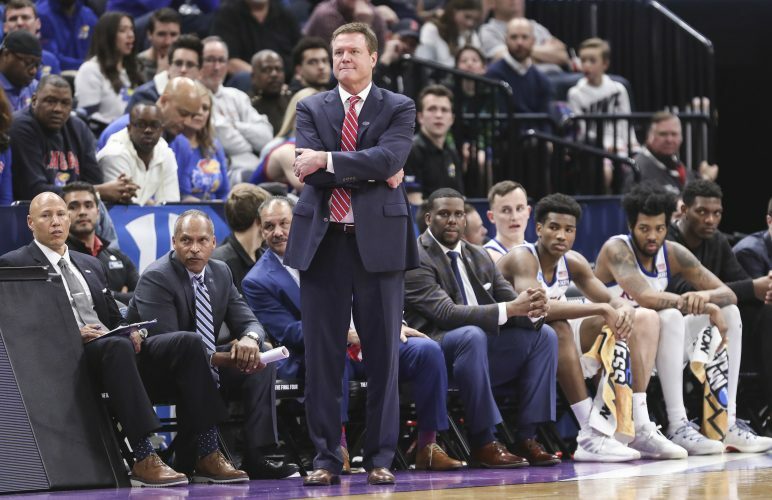 Tuesday, Yahoo columnist Dan Wetzel reported that a defense attorney for Adidas official Merl Code tried to get a bugged phone call between KU basketball assistant coach Kurtis Townsend and Code admitted into evidence. The judge ruled it wasn’t relevant and therefore didn’t allow it. Still, attorney Mark Moore was able to read enough from the transcript of the call to shed Kansas in a shady light. Moore read so little of it that the context wasn’t complete, but it still didn’t make Kansas look the way anyone wants to look in the court of public opinion, which is where reputations are formed. On the call, Code shared with Townsend what he had been told regarding what promises prospect Zion Williamson, or more likely what a family member or representative of the family, wanted from the school to which he would commit. 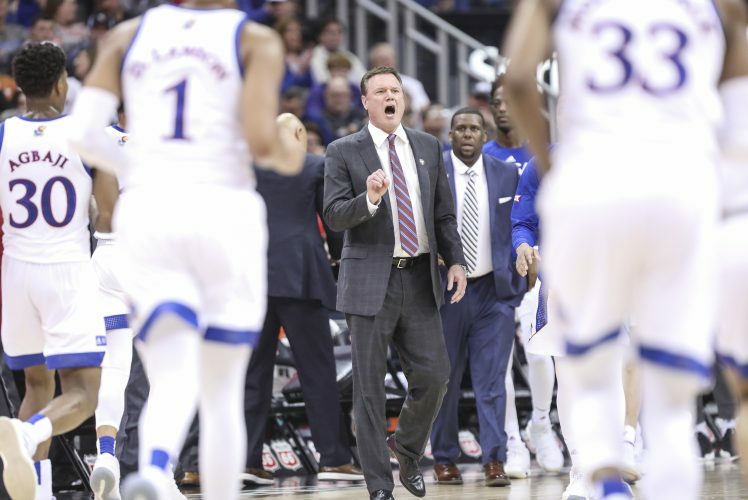 It’s possible that the rest of that tapped call never is released, and if Kansas just waits for it all to play out, then there is a good chance nothing in the way of NCAA punishment will come from it. But reading those words can’t make chancellor Douglas Girod anything but queasy. I would be surprised if he doesn’t meet with Townsend as early as today. The chancellor might even be uncomfortable enough about Townsend’s phone call and Self’s texts to announce later this week that he is hiring an outside investigator to look into the recruiting practices of the basketball program. 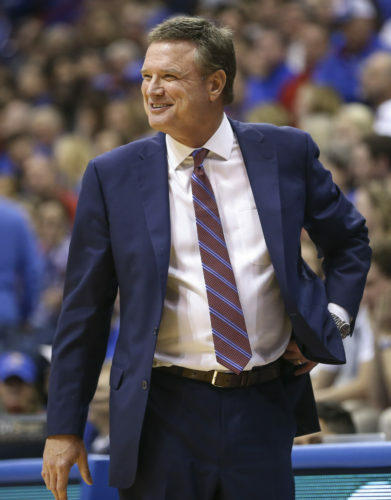 It seems as if the drip, drip, dripping of reports coming out of the trial has added up to a pool of uneasiness to the extent that the university will want someone to dig deeper so that the school can feel more equipped to answer the question that has to be nagging at the university’s top officials: Does Kansas believe it has a clean basketball program? Again, Duke landed Williamson; Kansas did not. But the question of whether Duke has a clean program is Duke’s problem, not KU’s.